Google just established itself as the undisputed master of the “Six Degrees of Kevin Bacon” game with a new “bacon number” search Easter Egg. If you're not familiar with the parlor game, the goal is to find the shortest connection path between any given actor and Kevin Bacon. For instance, Christopher Walken starred with Chris Penn in “At Close Range,” and Penn starred with Bacon in “Footloose.” Walken, therefore, has a bacon number of two. With Google Search, you no longer need to be a movie buff to win the game. 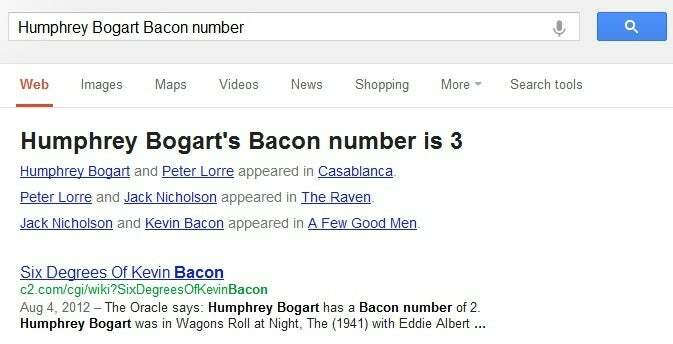 Just type the actor's name and “bacon number” into the search bar, and Google will list the degrees of separation and the points of connection between each actor. This trick, first reported by The Next Web, works on both the desktop and mobile versions of Google Search. The Easter Egg seems like a fun way to show off Google's Knowledge Graph, a search tool that debuted in May. When searching for certain terms, including actors, Google now displays information directly on the right side of the search results page, similar to the info boxes on Wikipedia entries. These results draw on public sources such as Freebase, the CIA World Factbook and Wikipedia, and the idea is to provide direct answers to queries instead of sending users to another website. For even more Google Easter Eggs, check out our master list of them.